This blog previews and discusses one of the top priorities for Africa in 2016 as shown in Foresight Africa 2016. Read the full report here, which covers other critical issues affecting the continent. You can also watch video or listen to audio from our annual Foresight Africa event. For a long time, the 54 countries of Africa have been a patchwork of different languages, laws, and currencies, making travel (let alone business) on the continent quite an endeavor. Indeed, for businesses, for a long time being in Africa has required moving from country to country, which too often means more than just navigating a map and changing money—it includes meeting different standards, understanding different laws, and paying different tariffs at every (and there are many) border crossings. At the same time, African countries, many landlocked and small, face unique challenges in being able to scale industries and access markets. How might Rwanda export its coffee if it has no access to the ocean? How might a line of countries best collaborate to create a railroad or road spanning their collective land for the benefit of all? How might countries with different advantages integrate into global value chains? And so, in 1991, 51 heads of state and government signed the Abuja Treaty, which established a roadmap towards an African Economic Community to be completed by 2028. In 2013, the African Union, created Agenda 2063—a vision and action plan—which, among other objectives, sets out to better integrate the continent to circumvent and even knock down these obstacles to trade, investment, and overall economic growth. Thus, the African continent has been creating and fostering “regional economic communities” with the aim of facilitating trade and eliminating economic bottlenecks. 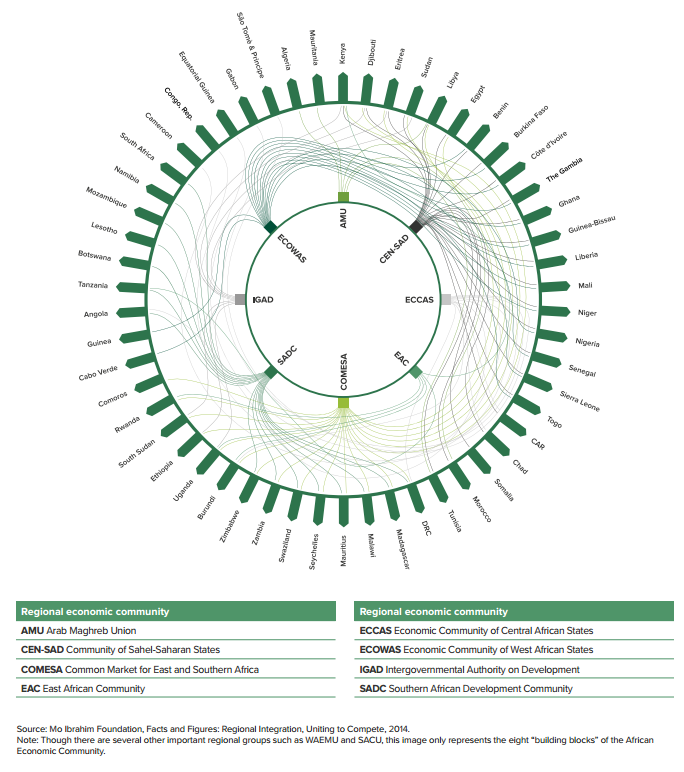 Eight of these communities, as seen in Figure 1, are the “building blocks” of what will eventually become the African Economic Community. This goal, widely shared across the continent, does require patient negotiations, complex compromises, and strong political will—as many authors in this year’s Foresight Africa note. Many regions of Africa have seen a lot of success in integration. For example, the East African Community (EAC) has implemented several joint infrastructure projects. The most notable one is the Arusha-Namanga-Athi River Road, a road which runs from southern Tanzania to northern Kenya. The road has facilitated movement of traffic in the region. It has also enhanced the import/export traffic from the port of Mombasa. The EAC has many other upcoming infrastructure projects, including the rehabilitation of the Kenya-Uganda railway. In addition, in 2015 three of the RECs signed the Tripartite Free Trade Agreement (more on this below). However, as seen in the complexity in Figure 1, Africa integration has not always been the smoothest. Overlapping membership—which brings with it still different rules and standards—makes it difficult for many countries to meet their obligations, and coordination across the various RECs can be challenging. A major part of integration includes the formation of free trade areas (FTAs) on the continent. As Foresight viewpoint contributor Soamiely Andriamananjara states, participation in regional value chains will help generate economic gains in the short run and facilitate the integration of African production into global value chains in the long run. Currently, as Andriamananjara notes in the publication, several regional trade agreements are under negotiation and a major one, the Tripartite FTA (TFTA), signed in 2015, brings a lot of promise. Set to be implemented by January 2016, it aims to unite three major regional economic communities: the Southern African Development Community (SADC), the East African Community (EAC), and the Common Market for Eastern and Southern Africa (COMESA). The TFTA covers 26 countries, whose economies accounts for more than 50 percent of Africa’s GDP and 56 percent of Africa’s population. The TFTA will serve as a building block toward the Continental FTA (CFTA), which would include all 54 African countries. The African Union is committed to completing the CFTA by 2017, which, if successfully implemented could stimulate intra-African trade by 50 percent. Consequently, the implementation of the TFTA and the CFTA, could lead to the diversification of African economies and therefore help reduce African countries’ dependence on raw material and primary commodity exports, while developing a greater capacity to compete on a global scale. Regional integration will not solve all of Africa’s trade problems, though. Africa must keep its eye on the global market in order to become competitive. For example, in his Foresight issue brief, Global Economy and Development Senior Fellow Joshua Meltzer prescribes that the African agreements are developed with rules and standards consistent with ones of the TPP and the TTIP. Read Foresight Africa 2016, which details the top priorities for Africa in the coming year, to learn more about regional political and economic dynamics are shaping the continent as well as other critical issues for Africa. Join us in person or via webcast on January 20 for our annual Foresight Africa event.